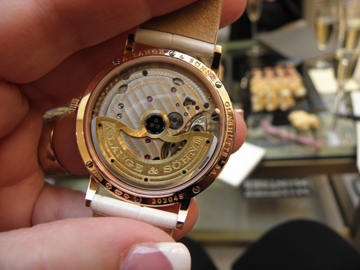 Recently, on a 3-continent tour with A. Lange & Sohne to witness its newest boutique openings, I had the amazing opportunity to spend the week with the Ladies Saxonia Automatic on my wrist. 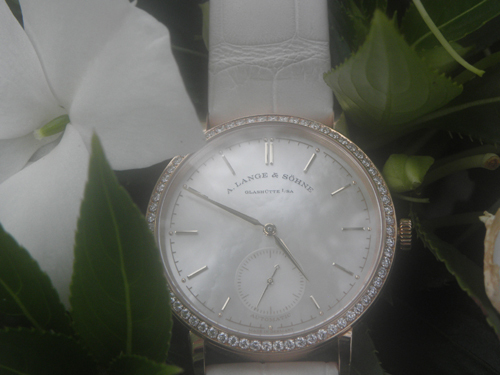 This watch is beautiful – simply, elegantly, comfortably beautiful. 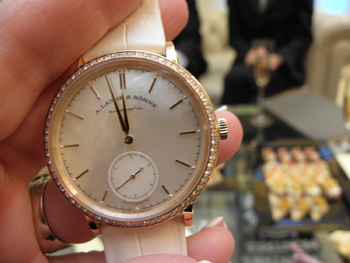 The 18-karat pink gold watch house sthe Lange manufacture caliber L086.4 self-winding movement with 209 parts and 31 jewels. Made of untreated German silver, the movement is lavishly and meticulously hand engraved — and visible via the sapphire case back. This proved to be a slight problem for watch-loving me, who kept wanting to take the watch off and look at the movement. It offers 72 hours of power reserve when fully wound and that was just fine- as this was a watch I didn’t want to take off my wrist. From the dial side, the watch is equally as beautiful thanks to the soft-hued pink gold, meticuloulsy set with diamonds on the case and featuring a solid silver white tint faced with mother-of-pearl dial. The watch has a very legible sub-seconds dial with stop seconds on it, and – thanks to the movement and the great Lange & Sohne craftsmanship – it runs like a dream. Beautifully appointed with a hand-stitched white croco strap, the watch is fantastic for day wear and night wear! It retails for $43,100, and if I had that cashola around I would definitely invest in this work of art both inside and outside.